Ever since their debut in 1985, the activist feminist group Guerrilla Girls has been fighting against discrimination and systemic inequality, calling out male and white privilege in the art world, as well as manifestations of inequality based on gender or race. 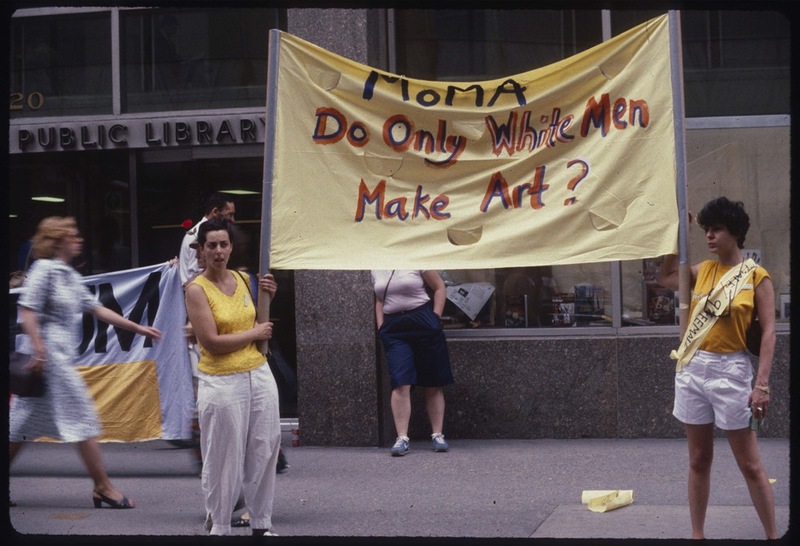 Nearly four decades ago, the anonymous activists were claiming that one of the most important museums of modern art, MOMA, included the works of only 13 female artists, as opposed to 165 men, most of them white. We´ve come a long way since, but how different is the situation today? Protest outside MoMA. Photo source: Guerrilla Girls Archive. Their iconic 1985 poster looks and sounds uncannily current: “Do women have to be naked to get into the Met. Museum. Less than 5% of the artists in the Modern Art section are women but 85% of nudes are female." Tellingly, the poster got an update in 2012 to “less than 4% of the artists” and “76% of the nudes.” An equally powerful piece targeted several other major institutions: “How many women had one-person exhibitions at NYC museum? Guggenheim 0, Metropolitan 0, Modern 1, Whitney 0." The strength of this type of critical stance lies in a simple format and undeniable facts. This type of minimalist revolution speaks volumes and weighs heavily, particularly when directed at giants among art institutions. Do Women Have To Be Naked To Get Into the Met. Museum?, 1989 by Guerrilla Girls. Curated by Mark Godfrey and Hannah Johnston, a recent exhibition at Tate Modern puts together works by Guerrilla Girls and Andy Warhol, emphasising similarities and differences in the oeuvre and practice of both artists. The exhibition points towards the common practice of using existing formats and imagery to subvert pop culture and make a (political) statement, as well as the embedding of textual and visual patterns from the world of advertising. The argument stands, and the parallel is clear. It´s interesting, and maybe ironic, that a group of anonymous female artists is being put together with one of the most recognisable names among male artists of the 20th century. If the first can be associated with a combative style, clearly targeting social issues that directly affect individuals, the second is known for a more detached and neutral way of using his art as social critique. 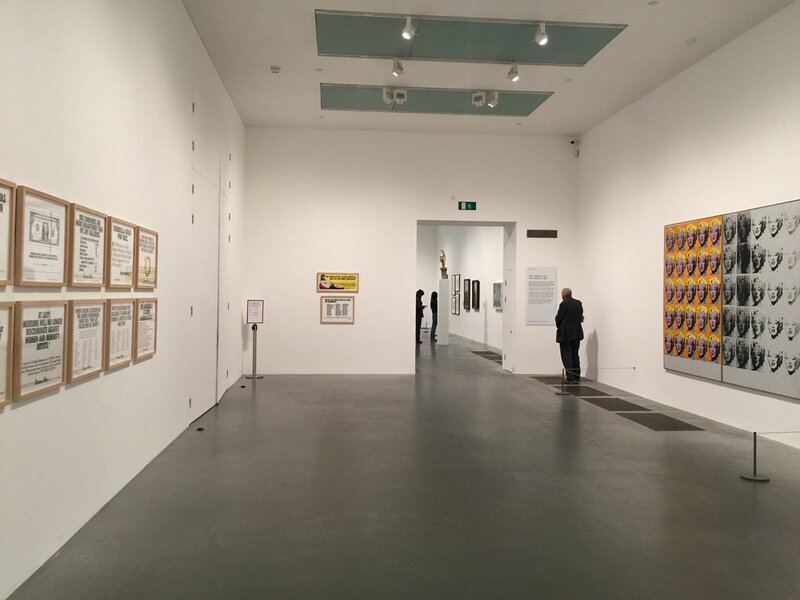 Exhibition view: Guerrilla Girls and Andy Warhol at Tate Modern, 2018. Women Artists In The Andy Warhol And Tremaine Auctions At Sotheby’s, 1989 by Guerrilla Girls. What can we make of this joint exhibition? Can we use the fearless work and confrontational spirit of the Guerrilla Girls to (re)interpret Andy Warhol today? Can Warhol´s cool, non-conforming creative persona be a clue to how we see the work of Guerrilla Girls? One certainty lies in the fact that both artists inform a unique mode of seeing the world – never passive, even if distant; always focused, especially when minimal. This may be a clue to how we should fight our fights today: when constantly bombarded by discourse and visual clutter, we need to learn to focus on the undeniable; to use the recognisable and the relatable in ways that escape entrapment; to learn to feel free and strong in the midst of an anonymous crowd, and remain free and strong when standing alone.